Did someone say….real cuts of tender chicken prepared in natural juices? It’s more than just delicious! The FLAVOR-LOCK pouch makes serving quick and easy, and holds in freshness. 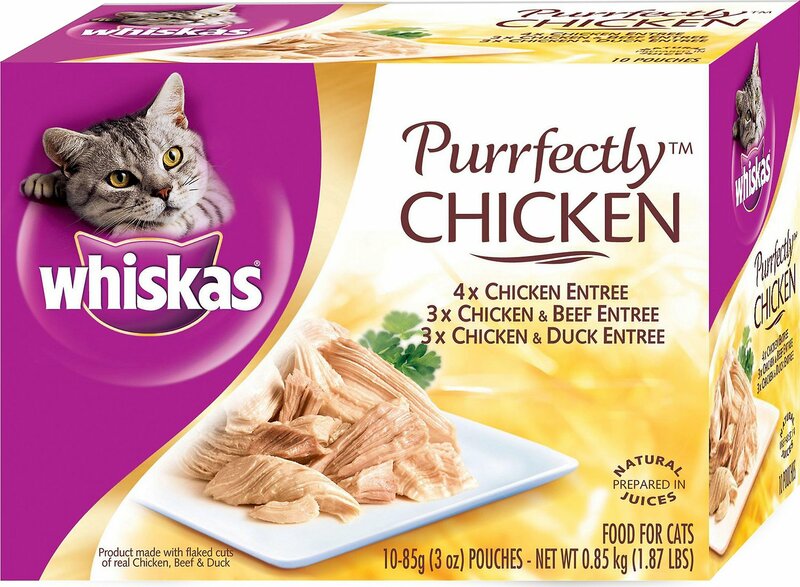 Variety pack of 3 different flavors of Whiskas Purrfectly Chicken cat food pouches: Chicken Entree, Chicken & Beef Entree and Chicken & Duck Entree so your kitty can have a yummy variety to pick from at dinner time! 100% completed and balanced meals that are made in the USA! Feed Adult cats 1 pouch per 5 lbs of body weight 3 times a day. Two of my cats passed away, Susie and Blackie, one in January and the other one in February. Now I only have Chiquita, she didn't like the pouches, I'll stick to the the others. I also have cats in my porch and backyard. I had Blackie for 19 years and Susie for 14 years, I miss them so much. I foster shelter cats/kittens, feed and rehabilitate feral cats and Help maintain a feral colony in my neighbourhood, so I go through lots of cat food. This Whiskas food is some of the best I have found in terms of quality and low price. It really smells good (like real meat) and the cats all love it. Chewy had it on a special deal so I ordered lots and really stocked up!!! My cat wanted none of this. Tried after couldn’t find her favorite, Sheba Tuna cuts, but she turned away. Offered it to the cat across the street who comes over to say hi. She looked for something else before she decided she would eat it. Oh well, I’ll donate it to a local shelter. Seems like they pick and choose what they want out of these packs. They don’t seem to like the beef pieces in the chicken & beef and I can’t say as I blame them it doesn’t look like beef at all and probably isn’t! Even in the ones that are just chicken seems to be two different types of meat, one they like the other no..... but it does smell really good, just like home cooked chicken but of course it’s not! I have an older cat, around 12 years old, she's having a difficult time eating the hard kibble, but when I add this to her food for a treat, she gobbles it right up. She loves it, especially the Chicken and Duck variety. 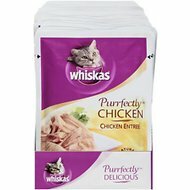 Good quality, lots of meat and the kittycats love the "gravy"
I split one pouch among 3 full grown cats and then give them dry food, and they do just fine and love it. They clean it up pretty good, considering how picky cats are. My cats love this! Me not so much. The aluminum packets have several folds at the bottom: not sure what they are supposed to do, but they make it way too difficult to squeeze the product out. The contents of each packet is scimpy enough so you want to get every last drop & morsel out. As I said, the cats all love it, but I have to reserve it for tempting them in special situations. For the cost, hassle, & amount, Fancy Feast is a better deal. These are great to keep on hand when you need a cat to eat or drink more. They smell like chicken soup. You can see the chicken. I only wish this was in can form. I always get some food on myself when in pouches. This is messy to feed. Can't get all of it out of the pouch and it is very "watery". Gets on my hands every time. Kitty likes it okay, but can not get it all out of the bowl because it is watery, so the bowl must be cleaned between feedings. Tried it because it was on sale. 1st trial of this type food. Won't reorder.